Like a face-lift, carpet re-stretching can remove any ripples or wrinkles from your carpet, giving it a new and refreshed look. Don’t know much about carpet re-stretching? We’re here to give you the low-down on all the basics! When do I know that my carpet needs to be restretched? If you find yourself tripping over your carpet because of buckles, wrinkles or bumps, it is time to get your carpet re-stretched. Loose carpet is the most common cause for carpet re-stretching, and it can soon become a hazard to you and your house guests if professional re-stretching is not done. What causes these bumps, rolls and wrinkles? Many different things can cause your carpet to ripple. Improper installation – if carpet is not stretched properly during installation, the carpet can loosen. Over-wetting – over-wetting can result from improper cleaning, flooding or moisture from beneath the carpet. De-lamination – this occurs when carpet separates from the backing. If this happens, a warranty claim should be made as soon as possible because it could be a manufacturing issue. The wrinkles don’t bother me – why should I have my carpet re-stretched? If carpet bumps and ripples aren’t enough to convince you to get your carpet re-stretched, consider the fact that avoiding it may cause you a lot more money in the long-run. Tight carpet is much easier to clean than loose carpet, meaning you’ll get better, longer lasting results whenever you clean it. The longer you ignore your loose carpet, the closer you get to having to replace it entirely which can cause hundreds or thousands more than a re-stretching. 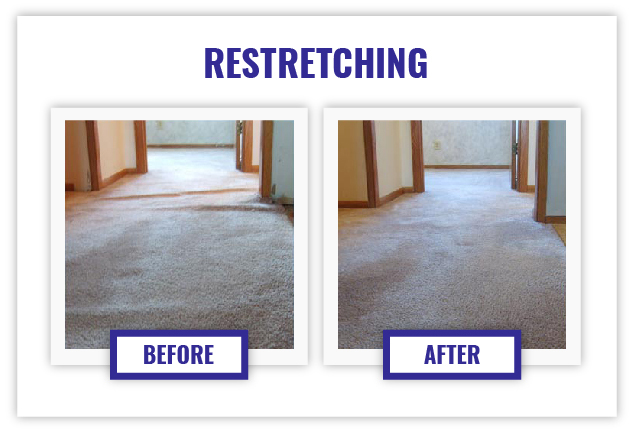 If you want to fix your wrinkles (in your carpet), give our carpet stretching experts a call today at 612-825-9797.